Today’s Armenia, like that of the past, is a place of challenge and triumph. Still emerging from economic hardship, it faces unemployment, environmental concerns, political unrest and widespread emigration. However, this tiny nation in the Caucasus Mountains looms very large in the hearts of Armenians, both the three million living within the country and the eight million who are part of the world’s Armenian Diaspora. For the Armenian people, who have existed for five thousand years, sometimes without a country to call their own, the modern borders are simply artificial lines drawn by larger foreign powers in the early twentieth century. Geography is much less important than what it means to be Armenian—to have created a proud culture, to have passed it down to one’s children, and, most importantly, to have survived in tragic circumstances against almost unbelievable odds. As such, for the traveller to Armenia, some knowledge about the history and culture of the country is essential to appreciating its people. Culture Smart! Armenia provides a concise historical survey from ancient to modern times and addresses the way in which thousands of years of struggle have created a cultural memory that continues to define the Armenian people today. 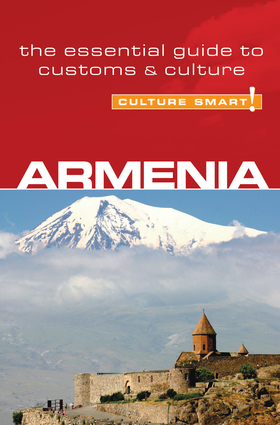 Sections on Armenian cultural and social life, building friendships, avoiding cultural faux pas and business etiquette mean this guide is essential reading for those who seek to do more than just scratch the surface and approach the beating heart of the country; it's people. If you are invited for a meal, there will be pre-dinner snacks (nuts, salty cookies, and so on) ready on the coffee table, and you will be invited to help yourself. Make sure you take something — no one will eat until you do!